Achieve this clean, dramatic look. Learning how to apply Geisha makeup can give you the upper hand in the makeup artistry department. The look is both elaborate and striking, and achieving it might take some effort. The result, though, is well worth the time. Rewind back to 2005, when the film adaptation of Memoirs of a Geisha was released and the Geisha girl look was splashed all over the pages of fashion magazines. Beauty companies released tie-in products to coincide with the release of the film and women across the country made the look their own. Though the Geisha look's popularity may have faded within the media, it is still widely recognized the world over for its striking, bold and unforgettable makeup. A stark, snow white face acts as a backdrop for the deep crimson lipstick, smoldering dark eyes and thick eyebrows. Traditional Geishas go through quite a time-consuming process in order to achieve their look. It requires a great deal of expertise and patience, but the result is well worth the effort. The first step involves warming up a waxy substance called bintsuke-abura until it dissolves into an oily consistency. This is then applied to the face. Next, a paste is formed with white powder and water and applied with a bamboo brush over the face, neck and down toward the chest. Typically, a line of bare skin is left around the hairline and nape to suggest a mask-like effect. The eyes and brows both are exceptionally dramatic and colored in with black. A hint of red is also used around the eyes. Thanks to their enigmatic red color, the lips typically attract plenty of attention on a Geisha. The color is infused with crystallized sugar, which adds a lustrous finish to the lips. This look defines the traditional style that most identify with when they hear the term Geisha. There's nothing more fun for a makeup fanatic than experimenting and coming up with creative new ways to adorn the face with color. 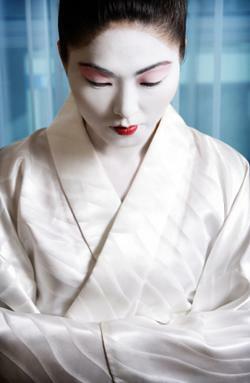 Achieving the Geisha look is a great way to fulfill some artistic fantasies. It can be challenging, but it's not impossible! Learning how to apply Geisha makeup can give you some options for a variety of occasions -some people choose to dress as a Geisha for Halloween or a costume party, while some just want to impress their friends with their newfound talent. Here's how to achieve the Geisha look. Of course, you can expect to spend some time working on it for your first attempt, but don't let that stop you. The right tools and tips will set you on the track to success. You need authentic products to achieve a genuine, believable look. If you're serious about looking the part, don't think twice about investing in these cosmetics and brushes. These specialty items are available online at Hannari-Ya. Soften the Kabuki Abura in your hands and apply liberally all over the face, neck and top of the chest. Consider this a base for the Kabuki Oshiroi. Dilute the Kabuki Oshiroi in a dish of water and, using Itahake Cosmetic Brush #60, paint it over the same areas where you applied the Kabuki Abura (don't forget the lips and eyelids). Remember to leave a bare line around the hairline and nape. Note: Do not apply this product directly onto the skin. A coat of Kabuku Abura beforehand is essential for proper application. Then use a sponge to blend the makeup thoroughly and soak up any excess moisture. This also helps set the makeup. Using a cosmetic pad, apply Kona Oshiroi over the face to soften and blend the Kabuki Oshiroi. Use the Yachiyo Hake Cosmetic Brush to dust Kona Oshiroi around the eyes and on the cheeks. Soften the white color further with Tonoko Rouge. Dust it onto the upper half of the face with Itahake Cosmetic Brush #24 (don't forget the eyelids). Run the Eyebrow Cover Pencil over your brows to make them "disappear" and use the black eyebrow pencil to draw a fine, barely arched line in their place. Thicken the line slightly with the Red Lining Color and add a smudge of Tonoko Rouge for definition. Dip a cotton swab into the Red Lining Color and draw a small diamond shape on the outer corner of the eyelid. Then use the Yachiyo Hake Cosmetic Brush to brush the excess color inward and onto the top lid. Then use a cotton swab to bring excess color from the diamond underneath the lash line. Use black liquid eyeliner to create a fine line as close to the top lash line as possible. Apply a second line to create a thicker line. Create a lower lip line (don't follow your own natural line) to emulate the minimal Geisha lip with the red lip pencil. Do the same on the lower lip, drawing the line slightly higher than your natural line. This should leave some of your own natural lip above and below where the red color is. Fill it in with the Red Lining Color.